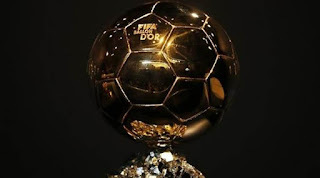 Ronaldo new boot has revealed the sensational forward has won the Ballon d'or for the 5th time. France football will hand out the individual award on Thursday afternoon, and Ronaldo's new boot shows he has won it already. Nike accidentally drop this hint when they revealed Ronaldo's new boot. On set of boots - the Mercurial Superfly V Quinto Triunfo CR7 - even reads "fifth triumph" when translated from Portuguese. The new boot is a mixture of white and gold and also have the years Ronaldo has won the Ballon d'or - 2008, 2013, 2014, 2016 - written inside it as well as 2017. CR7 recently announced that he is releasing Air Force 1 CR7 trainers and the colour scheme of white and gold matches the new boots. France Football will announce the winner of the Ballon d'or on Thurday. Florentino Perez (Real Madrid President) recently insisted the Sensational forward would pick up the trophy this season. Below is the link to see the new boot, with 2017 written on it.